We saw an unusual internet traffic dip in traffic across the LONAP network this morning as presumably people downed their devices and went outside to watch the solar eclipse. I only found out the eclipse was happening yesterday as the papers started to publish guides on how to watch it without looking directly into the sun. The chart thumbnail on the left shows the traffic building normally for the day. Then as the scheduled time for the event draws nearer you can see the upward curve stops abruptly and then drops down again. I was having a late breakfast in London at the time of the eclipse. Between mouthfulls I kept popping outside to see if there was any sign of it. Not a single ray! In fact the sun was nowhere to be seen in London. V disappointing. internet traffic dip during eclipse – exciting though the eclipse was a disappointment. We actually saw an increase of over 1.5Gbps between about 9:20 and 10:00 this morning (the eclipse occurring at around 9:30). 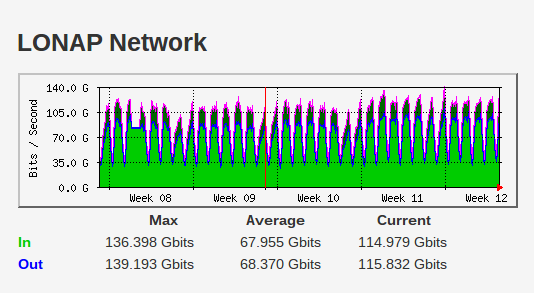 And actually looking at both LINX and LONAP total graphs,these do show a marked increase in traffic at these times. tbh it does look as if it was a bit of a spike. slightly odd pattern but I think we’ll just move on from this one.